New York, NY - Theatre Communications Group (TCG), the national organization for theatre, welcomes six new members to its board of directors: Raymond Bobgan, executive artistic director, Cleveland Public Theatre,Cleveland, OH; Will Davis, artistic director, American Theatre Company, Chicago, IL; Jamie Herlich, director of development, Seattle Repertory Theatre, Seattle, WA; Benita Hofstetter Koman, executive director, The Roy Cockrum Foundation, Knoxville, TN; Johamy Morales, education director, Creede Repertory Theatre, Creede, CO; and Randy Reyes, artistic director, Mu Performing Arts, St. Paul, MN. Kevin Moriarty, artistic director of Dallas Theater Center, Dallas, TX, returns for his second term as board chair, joining a slate of officers that includes: vice chair Kathryn M. Lipuma, executive director, Writers Theatre, Glencoe, IL; secretary Larissa FastHorse, playwright and choreographer, Santa Monica, CA; and treasurer Tim Jennings, executive director; The Shaw Festival, Niagara-on-the-Lake, ON, Canada. Rebecca Hopkins, managing director of Florida Studio Theatre, returns as the League of Resident Theatres (LORT) liaison. Returning board members include: Christopher Acebo, associate artistic director, Oregon Shakespeare Festival, Ashland, OR; Sarah Bellamy, co-artistic director, Penumbra Theatre Company, St Paul, MN; Joseph P. Benincasa, president and CEO, The Actors Fund, New York, NY; Kristen Coury, founder and producing artistic director, Gulfshore Playhouse, Naples, FL; Joshua Dachs, president, Fisher Dachs Associates Theatre Planning and Design, New York, NY; Teresa Eyring, executive director, Theatre Communications Group, New York, NY; Derek Goldman, co-founding director, Laboratory for Global Performance and Politics; Director, Playwright/Adapter, Professor, Georgetown University, Washington, DC; Susan Hilferty, costume and set designer, New York, NY; Marshall Jones III, producing artistic director, Crossroads Theatre Company, New Brunswick, NJ; Max Leventhal, owner’s representative, The Woodruff Arts Center, Atlanta, GA; Eileen J. Morris, artistic director, The Ensemble Theatre, Houston, TX; Lisa Portes, director and educator, Chicago, IL; Meghan Pressman, managing director, Woolly Mammoth Theatre Company, Washington, DC; Heather Randall, actor, producer, trustee at New York Theatre Workshop, New York, NY and Los Angeles, CA; Francine T. Reynolds, artistic director; New Stage Theatre, Jackson, MS; Ellen Richard, executive director, Laguna Playhouse, Laguna Beach, CA; Blake Robison, artistic director; Cincinnati Playhouse in the Park, Cincinnati, OH; Eric Rosen, artistic director, Kansas City Repertory Theatre, Kansas City, MO; Michael S. Rosenberg, managing director, La Jolla Playhouse, San Diego, CA; Nikkole Salter, actress, playwright, educator, and arts advocate, Bloomfield, NJ; Tim Sanford, artistic director, Playwrights Horizons, New York, NY; John Douglas Thompson, actor, New York, NY; Robert P. Warren, president, The William & Eva Fox Foundation, Bethesda, MD; and Shana C. Waterman, Head of Television, One Race TV, Los Angeles, CA. Members of TCG’s board serve up to three two-year terms. Board officers serve terms of one-year, renewable, and concurrent with the fiscal year of July 1, 2017 to June 30, 2018. 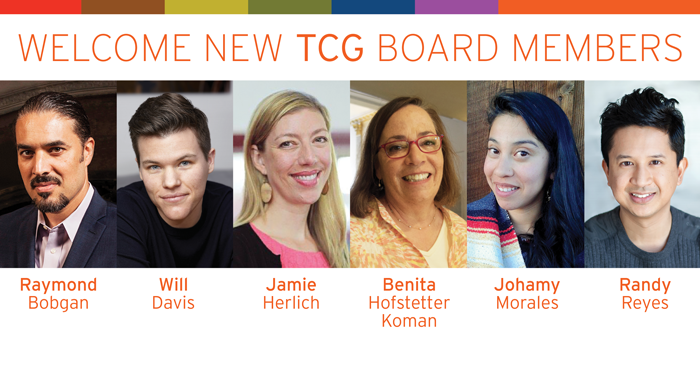 Learn more about the TCG Board here: http://www.tcg.org/about/board.cfm. For over 50 years, Theatre Communications Group (TCG), the national organization for U.S. theatre, has existed to strengthen, nurture and promote the professional not-for-profit theatre. TCG’s constituency has grown from a handful of groundbreaking theatres to nearly 700 member theatres and affiliate organizations and more than 12,000 individuals nationwide. TCG offers its members networking and knowledge-building opportunities through conferences, events, research and communications; awards grants, approximately $2 million per year, to theatre companies and individual artists; advocates on the federal level; and serves as the U.S. Center of the International Theatre Institute, connecting its constituents to the global theatre community. TCG is North America’s largest independent publisher of dramatic literature, with 15 Pulitzer Prizes for Best Play on the TCG booklist. It also publishes the award-winning AMERICAN THEATRE magazine and ARTSEARCH®, the essential source for a career in the arts. In all of its endeavors, TCG seeks to increase the organizational efficiency of its member theatres, cultivate and celebrate the artistic talent and achievements of the field and promote a larger public understanding of, and appreciation for, the theatre. www.tcg.org.